John William Waterhouse is an English Pre-Raphaelite painter. He became famous for his paintings of female characters taken from mythology and literature. He was also a draftsman, sculptor and a teacher. John William Waterhouse was born on April 6, 1849 in Rome, Italy. He was born to William and Isabela Waterhouse who were both painters. John had started training in the arts at quite an early age with his father providing him with training until he entered the Royal Academy schools in 1870. At the age of twenty five, he submitted his classical allegory Sleep and His Half-Brother Death to the Royal Academy’s Summer Exhibition. It was very well received and that encouraged him to submit later works to the Academy until his death. John later married a fellow Royal Academy contributor, Esther Kenworthy in 1883. The couple did not have any children. John eventually became a teacher at St. John’s Wood Art School and served on the Royal Academy Council. John Waterhouse was popularly known for his beautiful depictions of classical female mythology characters. One of his most famous paintings is The Lady of Shalott, which was a portrayal of Elaine de Astolat, who was said to have died of grief when Lancelot said that he didn’t love her. Anther notable painting of John Waterhouse is Ophelia, the fictional Shakespearean character in Hamlet. John painted several depictions of Ophelia, one of his famous of which depicted the tragic lass just before her death, sitting on a tree branch that leans over a lake and putting flowers on her hair. 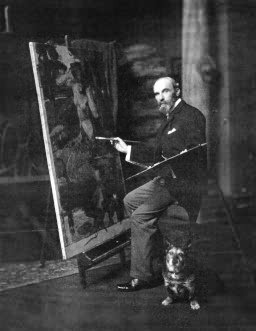 In 1915, John William Waterhouse was stricken ill with cancer and died two years later. He was later buried in Kensal Green Cemetery in London.